November 29th, 2016, Charlottetown – Island Speed Skaters earned a half dozen medals and nearly as many new P.E.I. records at the Harold Joyce Invitational Speed Skating Championships held over the weekend in Fredericton, New Brunswick. Andrew Binns of Stratford led the P.E.I. team with a gold medal and a pair of new provincial records at the recent Harold Joyce Invitational Speed Skating Championships in Fredericton, N.B.. Photo courtesy of Kristen Binns. Andrew Binns (Division 3) and Jane Bruce (Division 8) took home gold medals for the Island squad. Binns had a perfect weekend, winning all of his heats and finals enroute to the top of the podium, while also toppling a pair of five-year old provincial records for 13 year-old boys in the 200 metre and 1500 metre distances. Bruce, of Stratford, captured her first ever gold medal and first medal of the season after setting new personal best times in all four of her distances. Miriam Burnett (Division 1) and Thomas McQuaid (Division 3), both of Charlottetown, nabbed silver medals for the Island contingent. McQuaid also got in on the record setting action, earning his first individual provincial record, in the 1500 metre distance for 14 year-old boys. William Lyons (Division 3) and Kristen Binns (Division 1) earned bronze medals for the P.E.I. team. Lyons grabbed the provincial record for 12 year-old boys in the 1500 metre event as well, shaving more than a second from Niall Burnett’s 2010 provincial mark. The Island contingent proved dominant in Division 3, earning the top four spots among the 15 skaters in the division. Along with Andrew Binns, McQuaid and Lyons, Matt Kozma rounded out the top quartet for P.E.I.. Kozma also notched a provincial record in the 1500 metre distance for 15 year-old boys, giving the P.E.I. team a total of five new records over the weekend. Also competing in Fredericton for the P.E.I. team were Carter Bruce, Liam Chatfield, Simon Hale, Addison Bruce, Alex Rogers, Anderson Arseneau, Zachary Chatfield, Olivia Wood, Holly Nickerson and Rob Binns. The 17 Islanders were among 141 competitors from 11 clubs across the Maritimes and Quebec in attendance. Edouard Dionne of Riviere-du-Loup, Q.C. took the top overall spot for males while his club-mate William Monty was runner-up. Anthony Cormier-Losier of the Codiac Cyclones was third overall. Alyssa Rusk of Fredericton finished as the top ranked female skater in the meet, followed by Burnett and Kristen Binns. Competing elsewhere for P.E.I. on the weekend were Charlottetown siblings Andrew and Peter McQuaid, who raced for the first time in the Canadian Open National Qualifier meet held in Saguenay, Q.C.. Peter had his top finish and a new personal best time in the 1000 metre distance, taking 54th place overall in the elite national event. Andrew posted faster times through each round of the 500 metre event, before posting his career-best of 45.9 seconds in the final, enroute to a 58th overall finish. 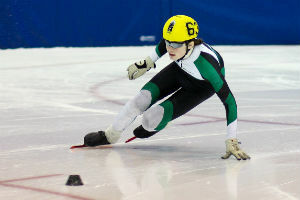 Next up for Island Speed Skaters is the Charles Gorman Memorial Speed Skating Championship, taking place at Harbour Station in Saint John, NB this weekend. More than twenty P.E.I. skaters will take to the ice in Saint John for their final regional competition of 2016.